It was mid-October 2016 and a light fog was giving way to a crisp, clear autumn morning at the Sunny 95 Park and Pond in Upper Arlington, Ohio. The daybreak was welcomed by a transient contingent of neighbors, joggers and dog-walkers. A flock of Mallards casually cruised the pond. A frisky canine viewed the waterfowl intruders. The ducks and the furry, four-footer had a vocal exchange on the legal, though non-binding, water rights to the pond. The debate was ruled a draw. No harm, no “fowl”. The avian delegation flew off; the domesticated mammal strutted away with its owner. A representative snapshot of activity surrounding a local pond in the lower Olentangy watershed. All creatures, large and small, human and not, can enjoy and benefit from a healthy aquatic environment. 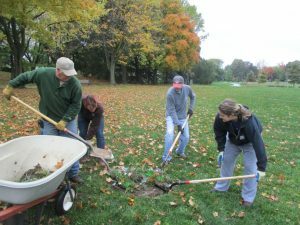 The Friends of the Lower Olentangy Watershed (FLOW) has grant funding (designated the Adopt-A-Pond program) thanks to a generous grant from LUSH Cosmetics. This program will help to improve the habitat and aesthetics of local ponds through the planting of native (soil stabilizing) plants. 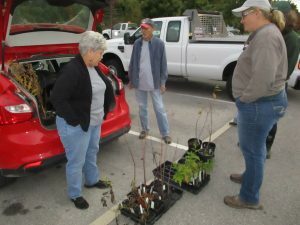 Multiple benefits of planting native vegetation include: increase the health of the Olentangy watershed, increase the variety of plants and birds around the pond, support native pollinators, provide food and habitat for butterflies and moths, provide more color and blooms, and reduce bank erosion and the rate of pond sediment fill. The Sunny 95 Pond is located in the lower Olentangy watershed and was selected as a site to be included in FLOWs Adopt-A-Pond Grant program. 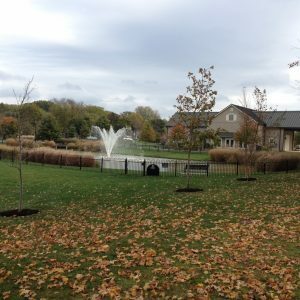 The pond is a one-third acre storm water retention pond centrally located within the 15-acre Sunny 95 Park development. 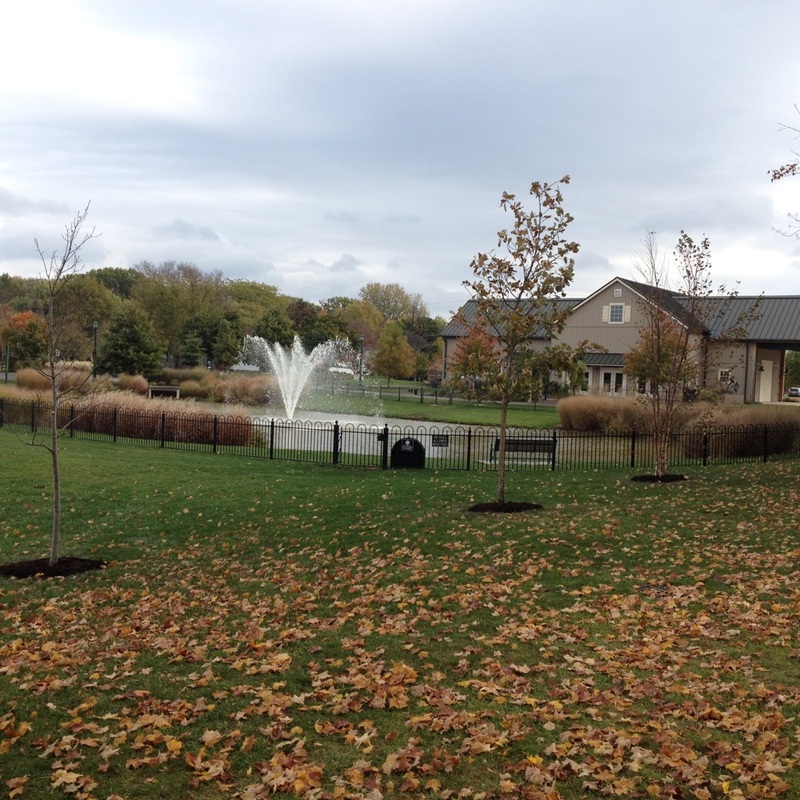 The park is located at the intersection of Windham Road and Carriage Hill Lane in Upper Arlington (UA). The park is a result of a decade-past UA master development plan resulting in the demolition of Langston Park and construction of multiple family-oriented facilities at the site. Completion of the new park area was opened to the public in 2010. 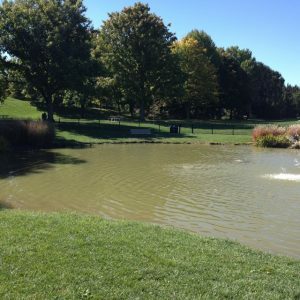 In early fall 2016, Laura Fay, FLOW Science Committee Chairman, and Steve Cothrel, Superintendent of Parks & Forestry, Parks and Recreation Department, The City of Upper Arlington, met on-site at Sunny 95 Park to discuss possible water quality enhancements to the Sunny 95 Pond. 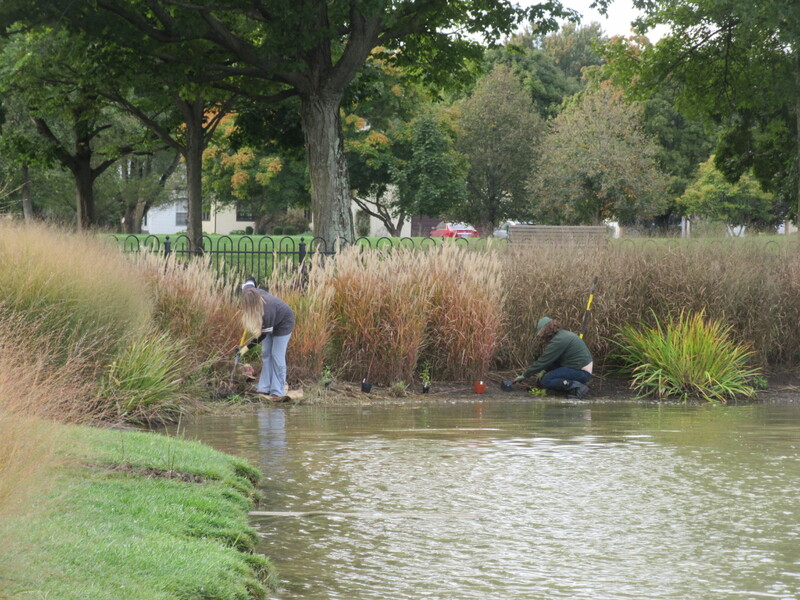 The pond shoreline currently had a variety of plants and tall ornamental grasses around its banks. However, a central fountain and resulting small wave action causes noticeable scouring and bank erosion. 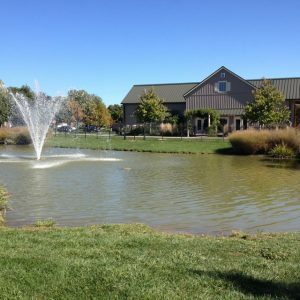 Scouring is especially noted along the eastern edge of the pond, primarily due to the prevailing westerly-southwesterly winds common in central Ohio. 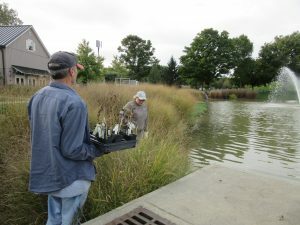 In addition, professional services for algae control and periodic dredging is part of planned maintenance for the pond in maintaining a healthy ecosystem. 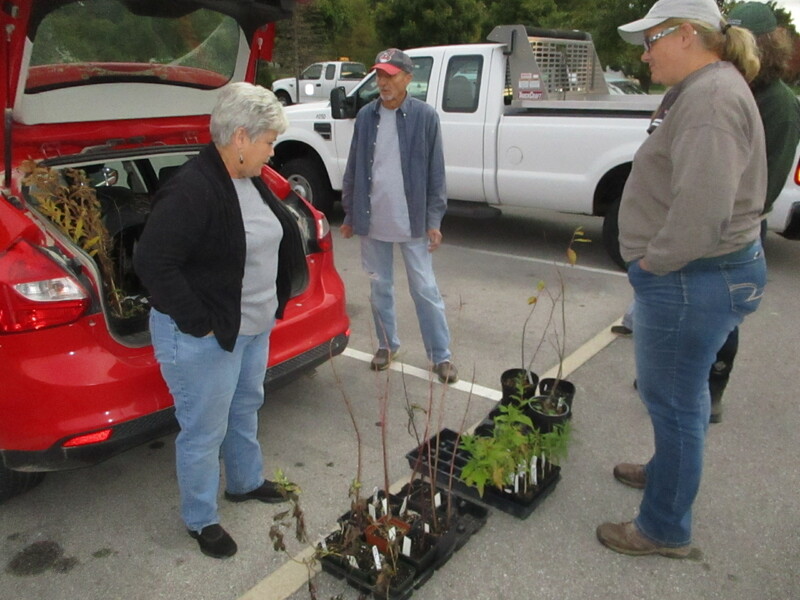 Mutual agreement was made by Laura and Steve to add an additional variety of native aquatic plants to the pond shoreline and to plant several native trees just beyond the pond landscape. 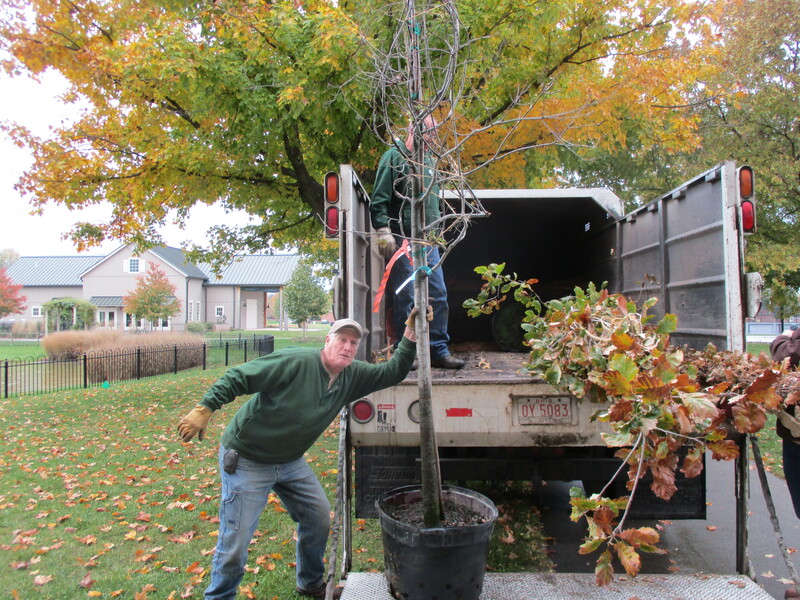 Lisa Metcalf, Horticulturist, Parks & Forestry, Parks and Recreation Department, The City of Upper Arlington, coordinated the selection and planting of plants and trees. Asclepias incarnata (red/swamp milkweed), Eupatoriadelphius maculates (spotted joe pye), Hibiscus mosheutos (crimson-eyed rose mallow), Mimulus ringens (monkey flower), and Cephalanthus occidentalis (Buttonbush). 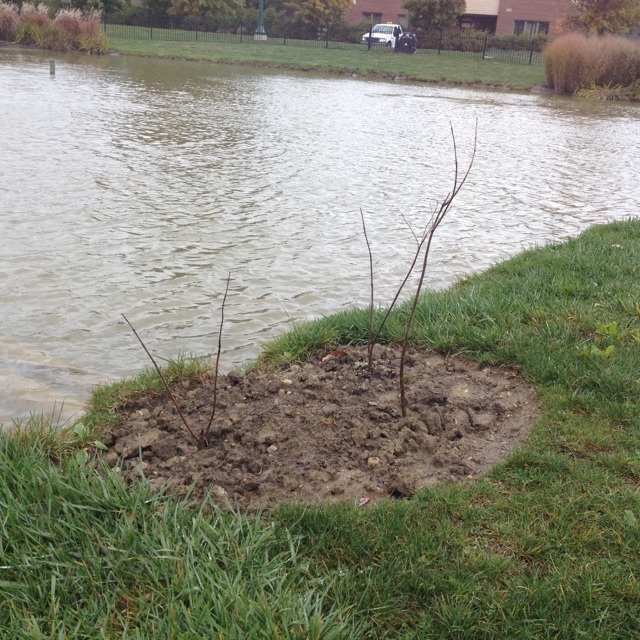 With shovels in hand, the new vegetation was planted at four different locations around the pond shoreline. In late-October, FLOW and UA Parks and Recreation Department staff met again. This time the group convened to add several trees to the park landscape just southwest of Sunny 95 Pond. 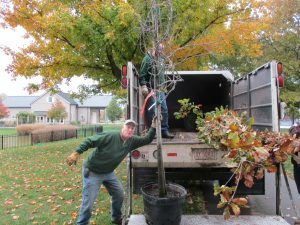 Three native trees were selected from Willoway Nurseries (aka Premier Plant Solutions): Betula nigra (river birch), Quercus bicolor (swamp white oak), and Quercus rubra (northernred oak). The two oaks had a sturdy 3-4 inch caliper trunk thickness. The river birch exhibited multiple 1-2 inch trunks from its base root ball. The trio of trees was 12-15 feet in height. With strong mind and body, holes were dug, tree root balls set in place, and surrounding rings of mulch spread. As the trees flourish and grow, they should provide additional shade to the pond. Special thanks to FLOW members Laura, Danielle, Bob and UA Parks & Forestry, Parks and Recreation Department personnel Lisa, Sarah, Scott, Veronica, and Jim. All contributed mightily in the joint effort to support FLOWs Adopt-A-Pond project and planting of the aquatics and trees at the Sunny 95 Pond. To date, the FLOW Adopt-A-Pond grant program has enhanced water quality and public awareness for multiple ponds in the lower Olentangy watershed. The Sunny 95 Pond project is one of the latest. FLOW has limited additional funding for this program and has recently reached out to local pond owners. The non-profit is seeking several additional participants interested in partnering with FLOW to add nature’s beauty and its benefits to their aquatic ecosystems.